Author: Diana Wimbs. Publisher: A&C Black Ltd. Originally published 1999. This is a book which I picked up about 15 years ago. It’s out of print, but is it out of date? Well, to an extent, yes. Despite it being published in 1999, there’s no mention whatsoever of the internet, which by then was becoming widespread. It’s also on the thin side, at just over 150 pages. It covers a lot of bases, but in not much detail, as you’d expect. Where it’s better than some is in identifying the breadth of the work you might expect to do as a freelance copywriter – brochures, letters etc. Even in those days, it was considerable, and that’s only multiplied in the last 15 years. But it’s a bit skimpy when it comes to the necessary knowhow for actually attracting and keeping clients. Perhaps the most useful chapter is on the financial side of affairs (how to charge, accounting etc) and other practicalities which are essential for any freelancer. It’s a ‘nice to have’ rather than an essential. And given that you can pick it up on Amazon for a song, it’s well worth it. As always, if you’re looking for any copywriting services, please contact me. 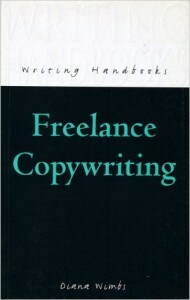 This entry was posted in Copywriting and marketing book reviews and tagged copywriting book. Bookmark the permalink.